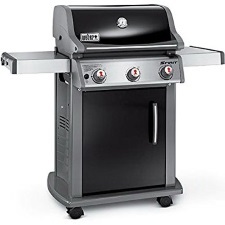 If you want a grill with ample room for a variety of items cooked at one time and easy ignition, the Weber Spirit E 310 Liquid Propane Gas Grill is the one you want. This option provides a variety of features that make it the perfect addition to anyone’s grilling arsenal. This grill is built to be around for the long haul with a sturdy, solid design and porcelain coated cast iron grates. With three burners in the grill, you can easily cook a large turkey or cook your favorite meats and vegetables all at the same time. No more rotating cooking and food getting cold while you’re finishing something else. This perfectly designed grill allows everything to cook together and come off together. ALERT! There is a newer model available: Read the review on the new Weber Spirit II E-310 Liquid Gas Grill to see if this one better suits you. When it comes to grilling your favorite foods, you may run into the issue of not having enough cooking space to grill everything at once. If you’re grilling for one or maybe even two or three people at a time, you can usually get by with any grill. However, if you want the versatility of ample cooking room, three burners to get just the right heat across the grates, and having all your food come off at once, then the Weber Spirit is your grill. With the large cooking area and three powerful gas burners, you can easily have your meal ready to go for all your friends and family without someone’s food getting cold. Using charcoal grills means you must wait around 30 minutes or so for the grill to heat up before you can start cooking. With the new Weber Spirit E310 and it’s easy to use electronic crossover startup, you can be cooking your dinner in no time. This ignition process makes it easy to get the grill heating up with just the push of a button. No worrying about lighter fluid, matches, or waiting for the charcoal to catch. This ignition system means you can be grilling up your favorites in no time flat. Looking on Amazon at the Weber Spirit E310 Liquid Propane Gas Grill you’ll find over 670+ different customer reviews. Many people have purchased this grill and shared their own stories of how much they love it, and a few things you might want to be aware of. Overall the consensus is that this is a great grill to work with. The rating on Amazon is 4.4 out of 5 stars total. While most people love the grill, there are a few who had issues. Some of those issues included flaking paint after only six months of owning the grill, need to start the grill in a specific pattern, and also the gas gauge not being accurate. 83% of reviewers gave this grill a 4 Star or a 5 Star rating! Others said they had problems with leaks but this was not a problem that seems to be consistent. One other complaint that was shared stated that at times it doesn’t seem to get all the gas to the burners so it isn’t as hot as it should be. This was again not a common complaint but one you want to look out for. Those who love the grill had this to say … “Excellent materials and build quality” … “Best grill I ever owned” … “Perfect Grill Marks” … “It gets hot!”. Overall it seems that the Weber Spirit E310 Liquid Propane Gas Grill is a great addition to your grilling plans. It fits perfectly on your back patio or your backyard kitchen giving you ample room for all your cooking needs. Whether you’re cooking for one or five people at a time, this three-burner grill offers a great working area. Enjoy easy access to all your tools with the convenient hooks, a sleek stylish grill when not in use, and ample room to cook all your meats and veggies at once. Get ready for a summer of delicious backyard cooking with this addition to your grilling toolbox.